Chilean Lily of the Valley Tree or Evergreen Snowbell- both descriptive common names for this unusual tree from South America. Fast growing evergreen tree that looks superficially like a live oak. 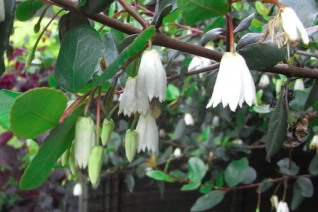 In mid to late summer relatively large pure white waxy bells appear and line the stems like small bells. The bottom of the waxy bloom is deeply serrated. Cool. To 16′ tall and half as wide. Often forms multi-trunks if you don’t want this then diligently prune it until you get one sturdy trunk. Do not site in the direct path of subfreezing east wind- a south or west exposure will do in windy areas. Easy to grow tree that gets by with a minimum of water in summer once established.